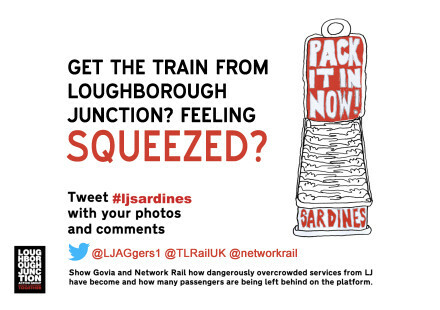 Appalled by the overcrowding services at Loughborough Junction LJAG presses on with its #ljsardines campaign. You may have seen some of us handing out leaflets trying to spread the word. Please spread the word and tweet. In January 2013 LJAG claimed a big victory for Loughborough Junction when the Department for Transport announced that our trains would continue to run through central London and it was no longer proposed to stop them at Blackfriars. But there is still more to do. We need a lift at Loughborough Junction. The disabled, people with buggies, travellers with heavy suitcases often can’t use the station. And we need more trains and longer ones to combat rush hour overcrowding. We continue to campaign for a stop at Loughborough Junction on the new Overground service. We think it’s crazy that there is no stop on this fabulous new service anywhere between Denmark Hill and Clapham High Street. The campaign started, in earnest, in August and September 2012 when the Department for Transport consulted on the Thameslink service franchise currently operated by First Capital Connect. Network Rail proposed that from 2018 ALL services on the Sutton loop line, the only trains which run through Loughborough Junction station, will terminate at Blackfriars instead of continuing north to St Albans and Luton. We surveyed people to find out how many people used the service to travel north of Blackfriars. The result was almost 1500 signatures on our petition, all of whom were in favour of the service continuing past Blackfriars and the vast majority of whom currently use the service to do just that. We delivered the petition to the Department for Transport when we submitted our formal response to the consultation.